One of our goals is to report on the building's performance and how effectively and efficiently we are operating within the building. Links to our analysis pages are below. 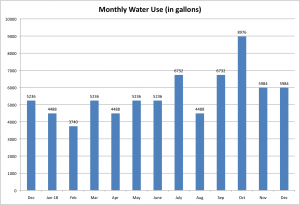 A look at our monthly water usage in gallons, costs, and comparison to industry standard. See our Water Usage Statistics page for more details. We weigh our trash each week, then chart the results. 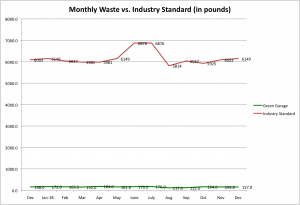 See our Waste Statistics page for more details. We examine our energy usage for HVAC equipment and other electrical equipment, monitor the kWh produced by our solar panels, and track our costs. 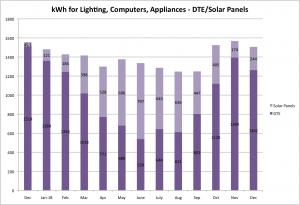 See our Energy - Electrical Usage Statistics page for more details. This page was last modified on 18 January 2019, at 11:01.